Beginning in 2019 I will be studying a Doctorate of Creative Arts for 4 years at Wollongong University. Female artists from across NSW exhibit artworks that respond to Meroogal and its sense of place, throwing new light on the personal stories of the people who once lived there, and the rich collection of objects that are still contained within the house. 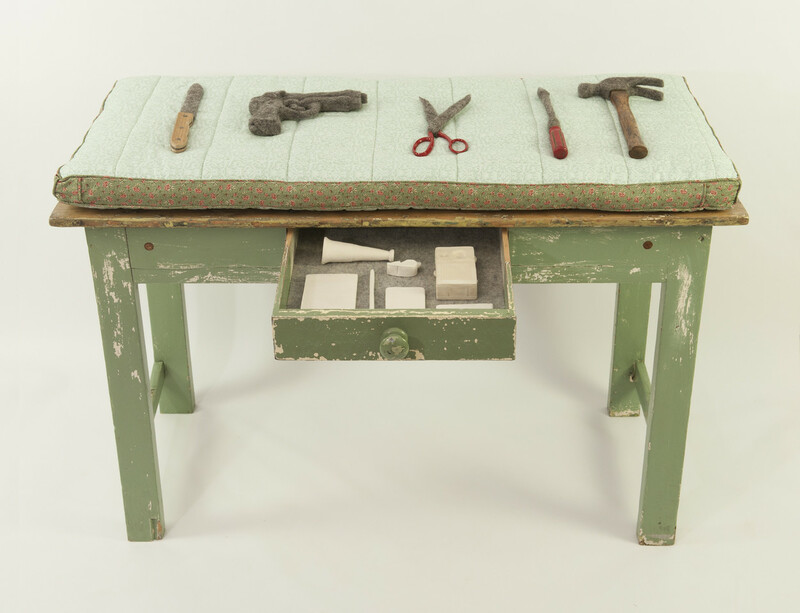 Solo exhibition of Anita Larkin’s work using collected objects, and felt. The works in the exhibition reveal how some objects can become representations of events in our lives. They can become embodied. Objects that have had a close prolonged physical relationship to the human body, such as a chair, a bed, ladder, or crutch, can hold particular resonance in our psyche. Curated by Anita Larkin and Anne Kempton, Membrane is an exhibition of artists working in the medium of felt. Artworks will be made in collaboration with other professionals in various fields, who also work with or construct membranes. Biology, taxidermy, architecture, boatbuilding, and waterproofing experts will be bought together with artists using this ancient material, felt.